PAG's Alan Yu, PAG CEO Henry Sun, Director of UNSW Knowledge Exchange Professor Warwick Dawson, Director of UNSW Digital Grid Futures Institute Professor Joe Dong. Source: unsw.edu.au. The University of NSW Sydney has signed a $3 million deal with renewables asset manager Providence Asset Group (PAG) as part of a 10-year commitment to joint research and collaboration in sustainable energy technologies. Professor Joe Dong, a researcher in energy systems and director of the UNSW Digital Grid Futures Institute, said that this funding would help to address a host of challenges, including electricity generation and transmission, new technologies in smart meters, Smart Grid telecommunication and computing infrastructure, renewable energy generation, and regulatory aspects of the industry. 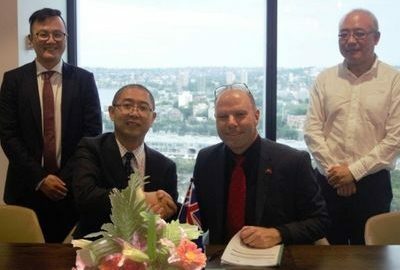 “It will also help us to develop a better understanding of what the renewables industry needs, developments in the sector in terms of technology, financial and risk management, as well knowledge transfer to the outside world,” Dong said.